SANTA CRUZ >> It was a one-stop shop for people in need at the sixth annual Project Homeless Connect in downtown Santa Cruz on Tuesday. 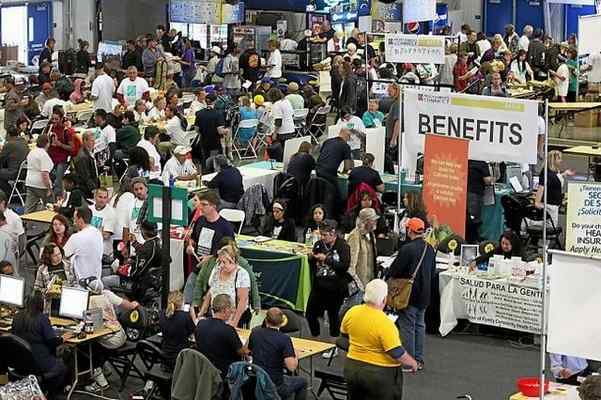 Held inside and around the Kaiser Permanente Arena on Front Street, the event was expected to draw more than a thousand people in need of health, social, mental, legal and housing services. Things like getting a dental check up, figuring out what to do about an impounded car, obtaining a state identification card or eating a hot meal. “When you’re homeless, the simplest things can be problematic,” said Rick Spidell, a 45-year-old homeless man. Spidell heard about the event when went to get a replacement social security card on Monday. Clerks at the office told him of the event and said it was a more efficient way for him to go through the process. “They definitely streamlined all the services to make sure it’s not so cumbersome,” he said. 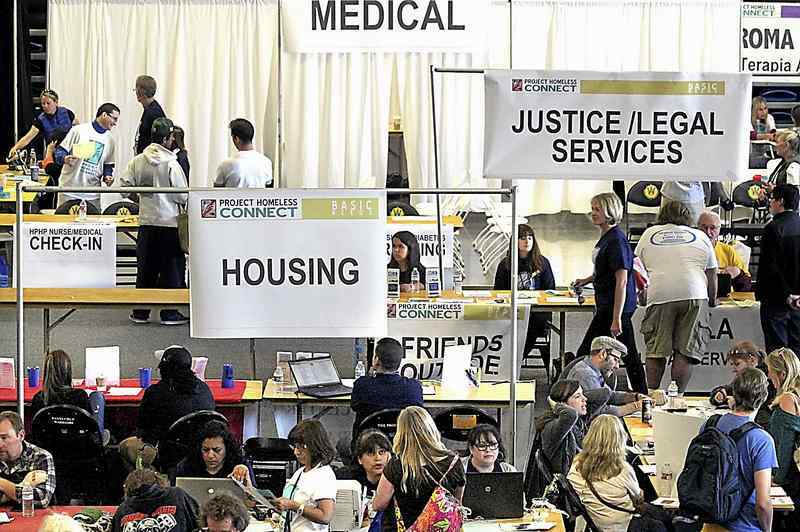 The annual event featured 45 programs that could immediately help anyone without wading through the bureaucracy and process that typically comes along with making an appointment for services. Instead of making an appointment with the doctor or the dentist and waiting for a few weeks, participants waited for a few hours for those services. They received massages, blood pressure checks and eye exams. The 2014 event drew roughly 2,600 to 2,700 people, Connery said. He added this year’s event is expected to draw just under that number. That issue is a driving factor for the annual event and spurred organizers to begin a second event in Watsonville. That event, scheduled for Nov. 6, will feature services tailored to Spanish speaking clientele and offer similar services. More than helping the homeless, the event breaks down barriers. Many who walked through the doors for the services were paired with volunteers who offered a friendly smile and served as a guide for the event. Cary Mendez, 46, is a homeless woman living in her car. At the event, she said she felt that respect from the volunteers and others at the event. “They’re not looking at me and thinking, ‘Oh, you’re homeless. I’m better than you,’” she said. “It’s important to educate them on all the resources Santa Cruz County has and how they can benefit from those resources,” Sanchez said.